Legacy Specialist Rose Candela Moore gives a behind-the-scenes look at preparing for Mel Chin: ReMatch, a major retrospective of conceptual and multidisciplinary artist Mel Chin at the New Orleans Museum of Art in Spring 2014. I began my work with conceptual artist Mel Chin through the Creating a Living Legacy (CALL) program with a big goal at hand—to prepare for Mel’s first retrospective, which will exhibit 40 years of his artwork. Mel’s retrospective opened at the New Orleans Museum of Art (NOMA) on February 21, 2014. 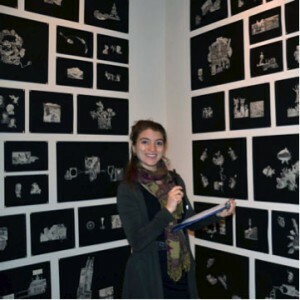 Needless to say, this undertaking was extensive and detailed because Mel Chin creates works in all mediums—from small drawings to on-site installations. Upon writing this entry, I realized that list making is part of my work for Mel—almost every day I create a list of what needs to be discussed and accomplished. In turn, here is a list for you—a possible guideline on how-to approach archiving and cataloging conceptual artwork. How do you need help in getting your art information organized? Getting clear on these goals will help you with your initial direction in this project, and will help you get to know the artist you are working with a bit better. Recording the artist discussing his/her work gives authority to the way he/she intends for the work to be seen and heard throughout time. For me, audio recording is a quick way I can go back and learn more about Mel’s pieces by revisiting his exact words. It often happens that other pieces are discussed, too. In turn, the conversation brings forth more information about Mel’s art that may be lesser known or in the process of creation. Documenting the artist can also be used for future purposes—even many years down the road. Read the CALL resources site for simple tips on getting good audio recording. Remember to always let the artist know you are ‘on the record’ in case they want to make sure a detail or two gets noted. One of the first topics in my archive work discussion (and continues to be today) with Mel is how to categorize his artwork. For instance, Mel’s site-specific temporary installation piece Ghost, 1991, came up as a (relatively easy) how to-categorize piece. In creating Ghost, Mel worked with a group to discuss the concept of the piece and to fabricate this work. It was a sponsored piece, a public art monument and there was a small performance that accompanied the work on the day it opened. It was not a permanent installation, so what exists today, are artifacts from the piece—and at times these pieces are what is seen in exhibition. I give this very specific example but would also like to note: there is no one-way to go about creating the categories—but it starts with a discussion. Mel and I created the categories together, and in turn there are themes in those categories that link the pieces together. You can list the piece in your database, and also link to possibly 2 to 20 other components of the piece as separate objects. Check out Mel’s website as an example of how many ways Mel’s work can be themed, categorized, and described. Mel Chin, his assistant Amanda Wiles and I worked together to design the information that is currently available on the website. How/where is this piece stored? Do you have installation notes? Who has written about this piece? Once you get concise with your list of artwork, then you can fill in the other details and questions about the piece. It’s always better to document what you have at this time, then go forward to fill in the blanks at a later date. Figure 1- Items from Mel Chin’s “Modus Operandi” exhibit, 1985. One way I have approached this step is by going through old checklists and information of Mel’s exhibits. It helps me to have some information already laid out, like the title, date, size, medium & materials. Then I was able to ask questions about more of the specifics. To start big with my organization, I began with the slides and typed checklist (items A and G). From there, I was able to start a list of what was in the exhibit. Then, I worked smaller: I went through the black and white photographed images to make sure I had records of all the works. From there I got clear on dates of pieces, titles, ownership, etc. from the other information laid out in Figure 1. There are still a few holes in the information, but the list is now more comprehensive than before I began; and I was able to identify many of Mel’s earlier pieces from one exhibit. 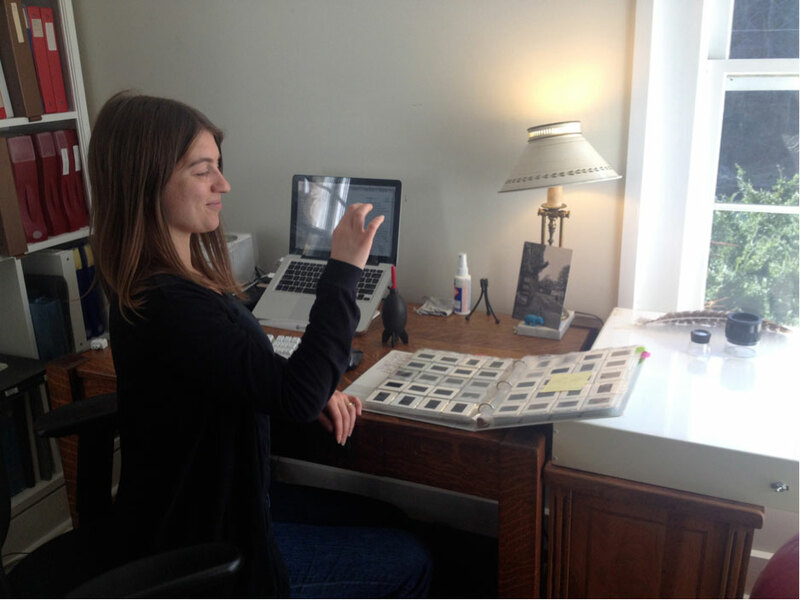 Rose Candela Moore cataloging Mel Chin’s piece, “The Funk & Wag from A to Z”, 2012, which contains 524 original collages. To simply put it , give yourself ample time to accomplish your goals. It may seem obvious, but it’s better to overestimate the time you need to do one task than underestimate. For me, I not only look at Mel’s artwork history, but there’s biographical and life information that is relevant to take note of, too. So within that, there is 60 plus years of information—as well as the current and future projects that need to be recorded. When you are swimming in piles (either digital or real) of information, remember that this process takes time! Get clear, ask questions, and seek support from other assistants. This work may take a year or two before the impact on the flow and storage of information becomes evident. But always remember: having one central record will help everyone tremendously, now and in the future. Planning for a retrospective is no easy task. But the end result is very rewarding—for the Artist and all those involved in the preparations. Mel Chin’s retrospective, opening February 2014 at the New Orleans Museum of Art, has been my main focus for the past few years as I work to develop a comprehensive and usable archive through the CALL program. Rose Candela Moore and Mel Chin and Amanda Wiles by Ben Premeaux. The overall planning of the retrospective takes the support and effort of numerous people. The collective effort to sort, organize and inventory the artwork now serves as the central location for research and information on Mel Chin’s life’s work. In this entry my intention is to present the infrastructure my team and I developed for preparing for the retrospective. These areas of focus may help you build a framework for preparing for a big exhibit and/or catalog. Where are these pieces located? Are the pieces inside crates? Do crates need to be built? When was the last time the piece was inspected? Is this piece ready for exhibition as it is? While you are creating an inventory, make note of what pieces need to be reviewed, in case there is some damage or repair needed, or perhaps the piece needs a new frame. Find out where other pieces are, via collectors or museums or galleries. Try to get in touch with the people or institutions to determine what condition the pieces are in, and if the pieces are stored in a shipping crate. For example, Mel’s work is stored in several buildings on his property, as well as in various institutions’ collections around the globe. At any given time, his work is also on exhibition in various locations. I designated a period of time to locating these pieces, making a notation on their condition and whether or not the piece was ready to be exhibited. Many of Mel’s work needed some extra care before being shown, particularly the installation items that have electronic components. After creating a solid inventory, then be realistic about what pieces are ready for exhibition in there current state. If there is restoration needed, create a list of what needs to be done. 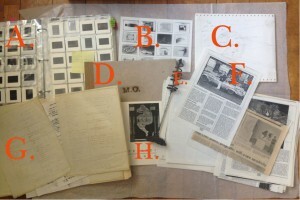 Does the work need extra professional input (like a paper conservator)? It was really helpful to me to create a list outlining each piece with the specifics around what needs to be done. I’ve worked closely with Mel to determine these factors, since many of his works are installations and have several components. We worked on the biggest details, like replacing an integral part, to the smallest details, such as making sure the plexiglass isn’t scratched. This may seem obvious, but the checklist is key for keeping your work focused and clear, as day-to-day activities can pile up. With an exhibition checklist you will be able to focus your attention on what pieces, within the checklist, needs extra attention. For example, Miranda Lash, curator of Contemporary Art in New Orleans, has had one main checklist for Mel’s exhibition. Some pieces shifted in and out of the list due to logistics, planning, etc. But for the most part, the list has remained the same. Also, the exhibition checklist has given me clear parameters to focus on getting specific information prepared for the exhibition and catalog research. Most major exhibitions also have a catalog as part of the exhibit. Gathering research materials together has been a major focus for me to assist NOMA’s curator Miranda Lash in her writing and for building a comprehensive timeline in the catalog. It was also my strategy for locating the right images for the corresponding retrospective publication. As I found information, I scanned articles, catalogs, and writings that corresponded to Mel’s pieces that were intended to be part of the exhibit. I then sent these items electronically to Miranda Lash. I often would find text and images that were obscure and rare to the public eye. Being able to locate and organize my research was essential to what and how I shared the information to be used for the retrospective. I’m saving this for last, but it is a significant part of the planning process. How long will the preparations of each piece last? If crates need to be built, how long will that take? How many people are needed to build each crate? How long will the research take for the catalog? How long will gathering the images together take? How long will the installations of each piece last? For Mel’s show, it has taken around 3 years to get the research in order and locate the artwork to be; crated, prepared, tested, and ready for the exhibit. These are some very important first steps for planning a large exhibition, like a retrospective. I think the most important element of preparing for an exhibition of this scale is to have clear communication and assignment of duties in the studio to the studio workers. This ensures that everyone stays on task and within the perimeters of a set timeline. As the artist’s, Archive Specialist, you can see the big picture for everyone to work toward and become the go-to person as detailed information is needed for each piece.